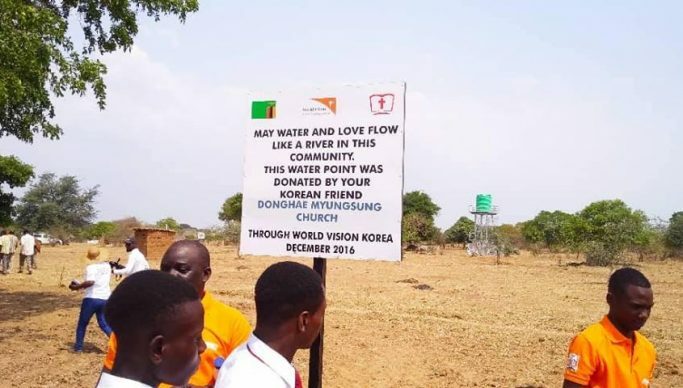 World Vision Korea has constructed a fully mechanised water system for more than six households in Monze district. And Monze Council chairperson Bisha Munsaka has commended non-governmental organisations and faith based organisations in the district for assisting in improving access to clean. Speaking during the commemoration of the Global Handwashing Day celebration on Tuesday, Munsaka said organisations such as World Vision Zambia should be commended for their efforts in promoting good hygiene practices by constructing a fully mechanised water system for 600 households in Hampande community in Monze. “We want to commend our major supporting partners, World Vision for constructing a water system that allows the households in Hampande to have running water from taps at their doorsteps. The fully mechanised system was constructed at an estimated cost of K462, 000 through World Vision Korea in partnership with World vision Zambia,” said Munsaka. And World Vision Monze Acting Manager Euprasia Nzima said the organisation was keen on helping the council in the provision of clean and safe water to all communities. “Our core business as World Vision is to promote better living standards. And we are happy that the community of Hampande is benefiting from our works through clean and safe water, and our hope is that all households will embrace handwashing and prevent diseases,” said Nzima. This year’s global Handwashing Day was being commemorated under the theme: Clean Hands- a Recipe for Health.